29th January: Back home again after a week in the sun. It did us good to have a week of rest, bo th for body and mind. The plots survived the snow and the gales in our absence, and I was glad that Abi had managed to mend the small shed before we went, replacing the worn felt and fixing the roof on firmly, which saved the roof flying off again. The day before we went, I sowed the chilli and sweet pepper seeds, and a few aubergines for good measure. I know I wasn't going to grow any this year, but they can go into the giant coldframe, where they will be proteced but not too hot. 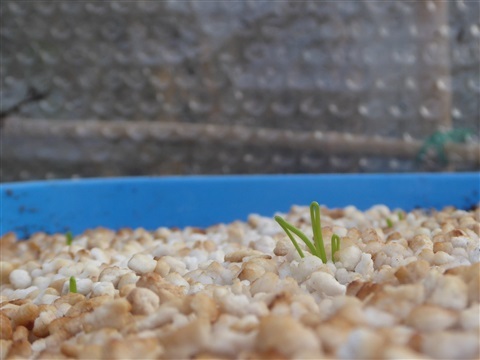 In the propagator seeds are germinating rapidly and tomorrow they will come off the heated tray and into the greenhouse, where the light will be better and the plants will grow more slowly too. Razzamatazz, Hungarian Peach, Serrano, Alberto's Locato Roccoco, Lemon Drop, Joe's Long Cayenne, Hangijiao1, Padron, Yukari Bakan and Early Jalapeno. 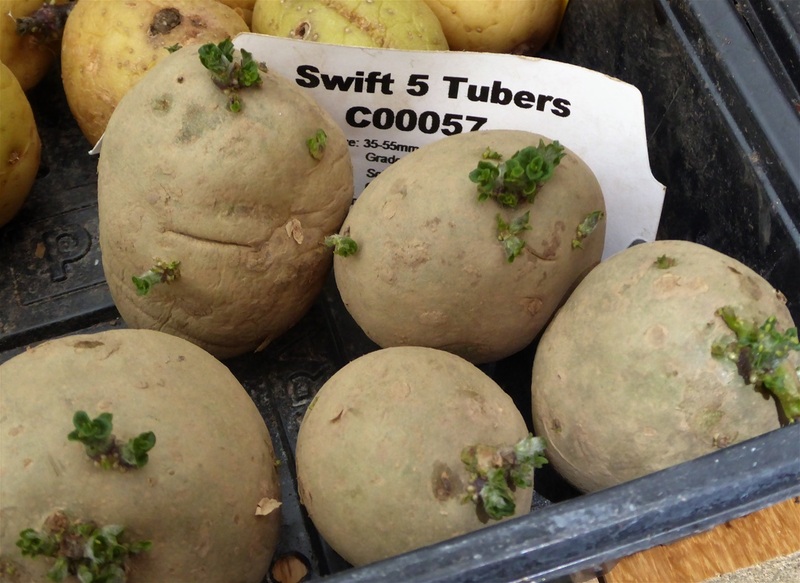 The seed potatoes are developing good strong chits, some green and some purplish coloured, depending on the variety. You can see from the header photograph that the first early Swifts are swift by nature as well as by name. There are only five, and they will be planted into the ground in the polytunnel around the end of February: I shall cover a section of one bed with an additional cloche to warm the soil further. I've not done this before, so am not sure how long it will be before they will be ready to harvest: maybe as little as eight weeks if we are lucky. 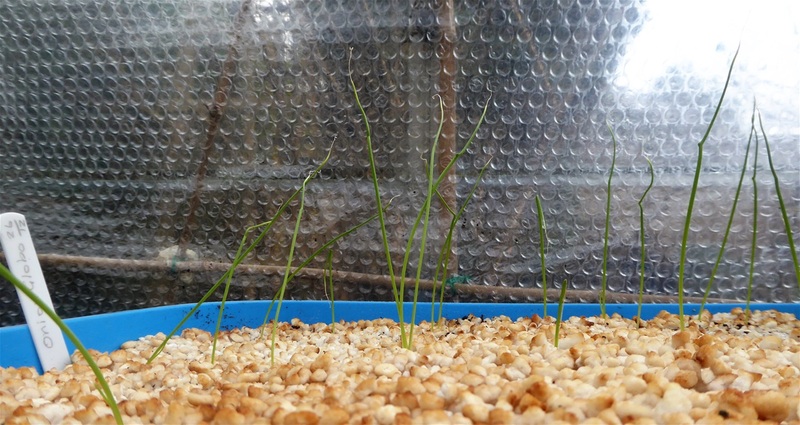 During last week, the Globo onion seedlings stretched out their "elbows" and are looking strong, well, as strong as plants with one leaf that are the size of blades of grass can do! 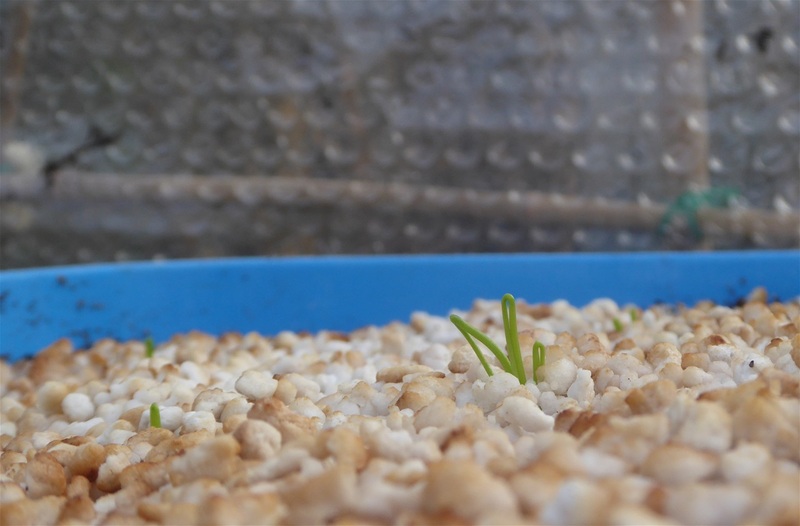 I sowed them well apart (29/12) so hope they will be able to continue to grow in their deep tray for several weeks yet. They will need feeding of course, as there the sowing mix lacks nutrients, but a splash of whatever is to hand will do the job. 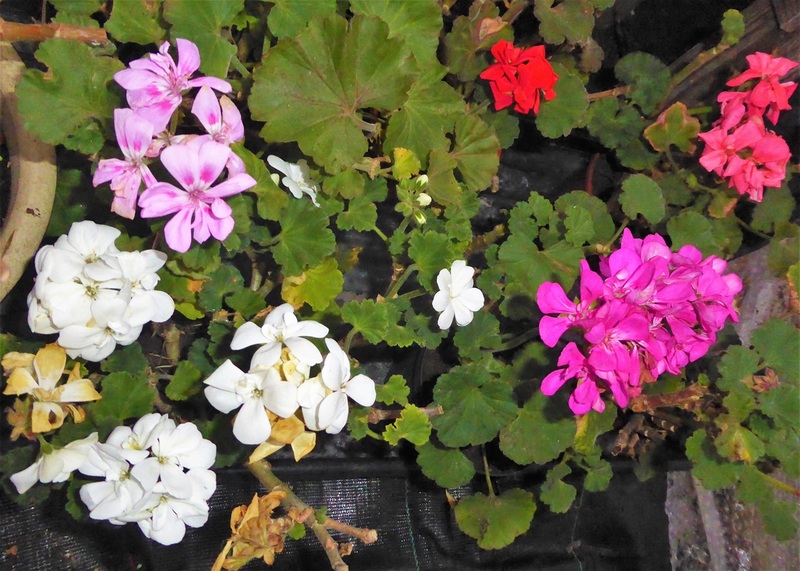 The plan is to plant them in the soil in the polytunnel border around the end of March. 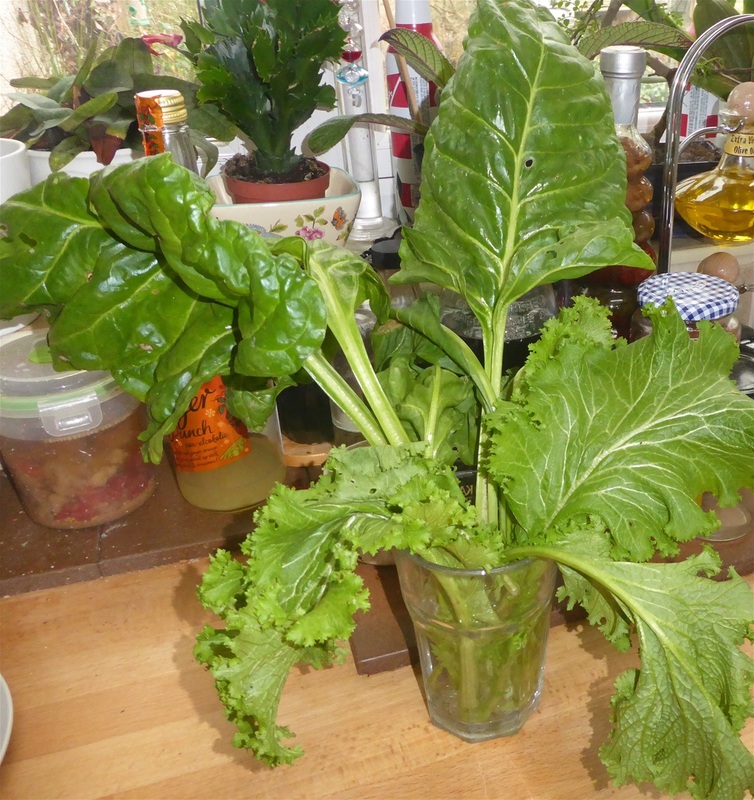 We have had something to harvest though: Perpetual Spinach and Frilled Mustard, both seen here, plus some Japanese Komatsuna, which we ate yesterday, before I remembered to take a photo. 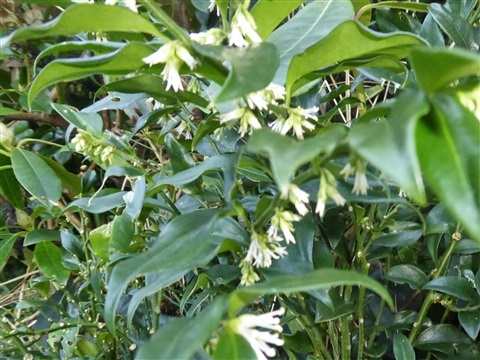 This last has thicker, darker green leaves with a very good flavour, so it'll be on our list for next Winter too. Harvest Mondays continue!!!! 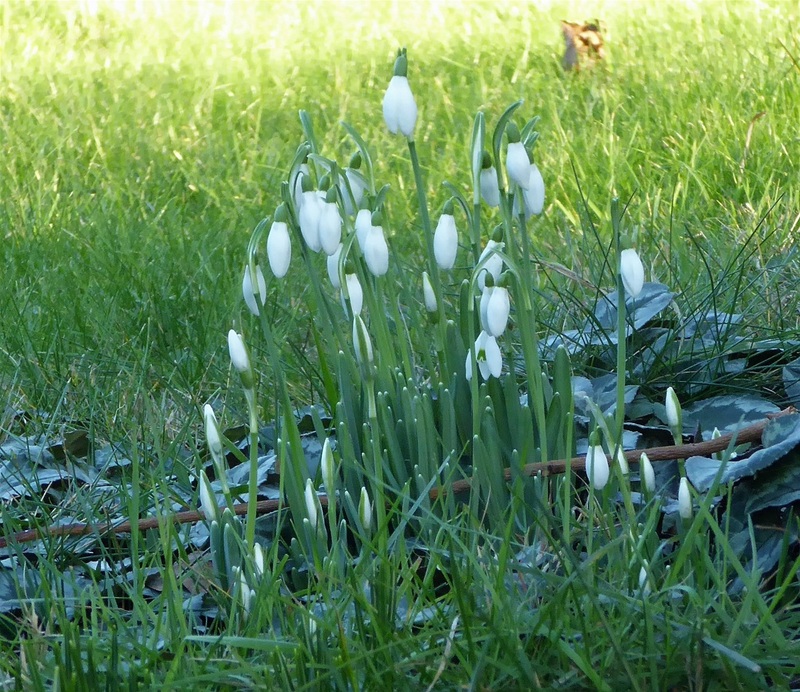 There was a very noticeable difference in the flowers in our garden after our week away. 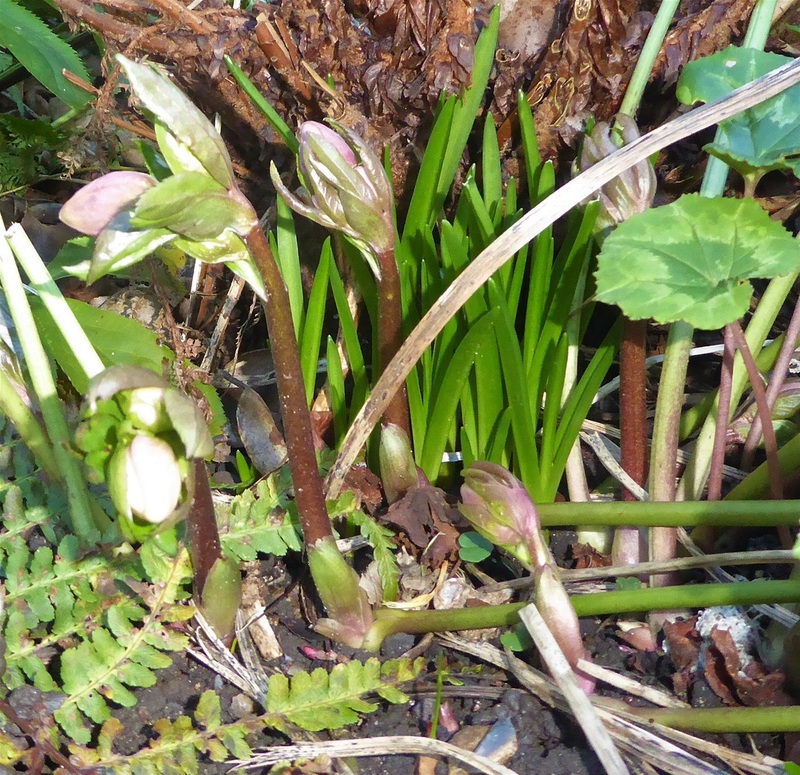 Some Hellebores are now fully open, with others well on the way. 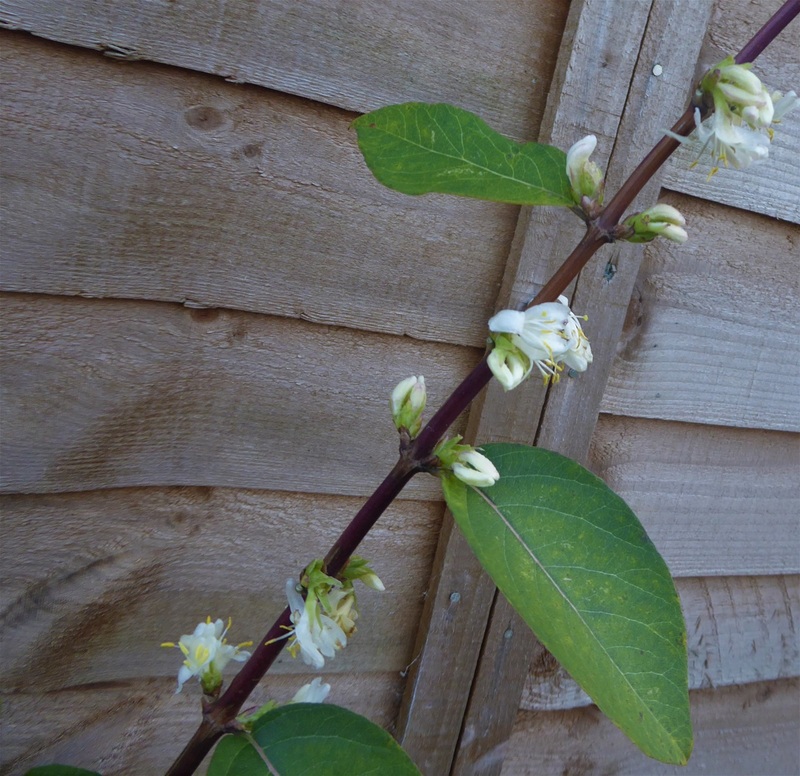 This one is part of a large clump under the shelter of a camellia bush, and is a beautiful clear colour. You do need to duck down low though, to appreciate the beauty of the huge boss of golden pollen hanging within the protective bell of the petals. The area of grass where the golden crocuses grow now gets about half an hour of sunshine each day when the clouds thin sufficiently, and the flowers then open, looking very cheerful. Thank you for reading this week's entry, which I hope you found interesting. 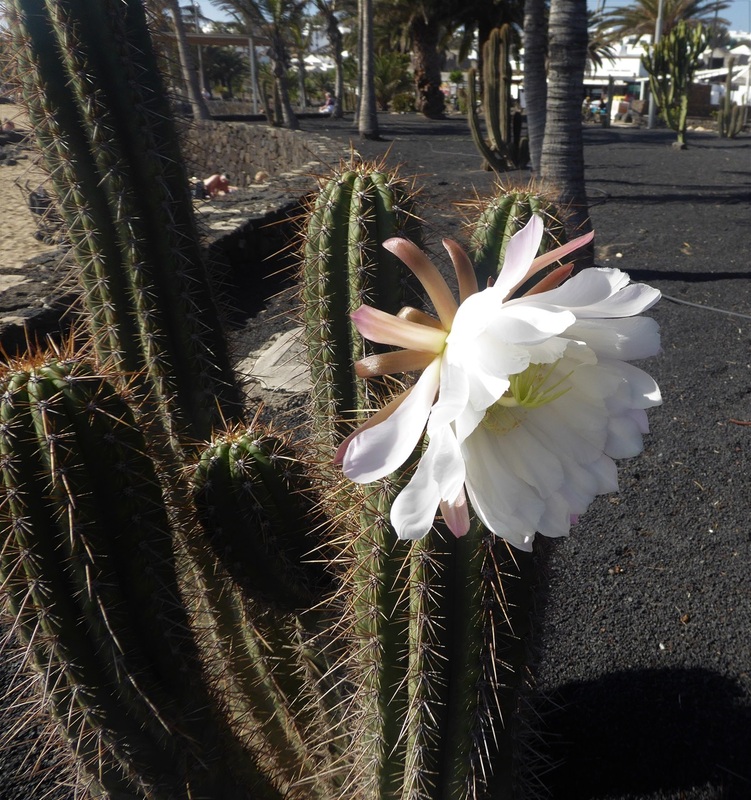 I shall be back next Monday as usual, with more early sowings indoors and, weather permitting more digging out of those paths! 15th January: We're off!! 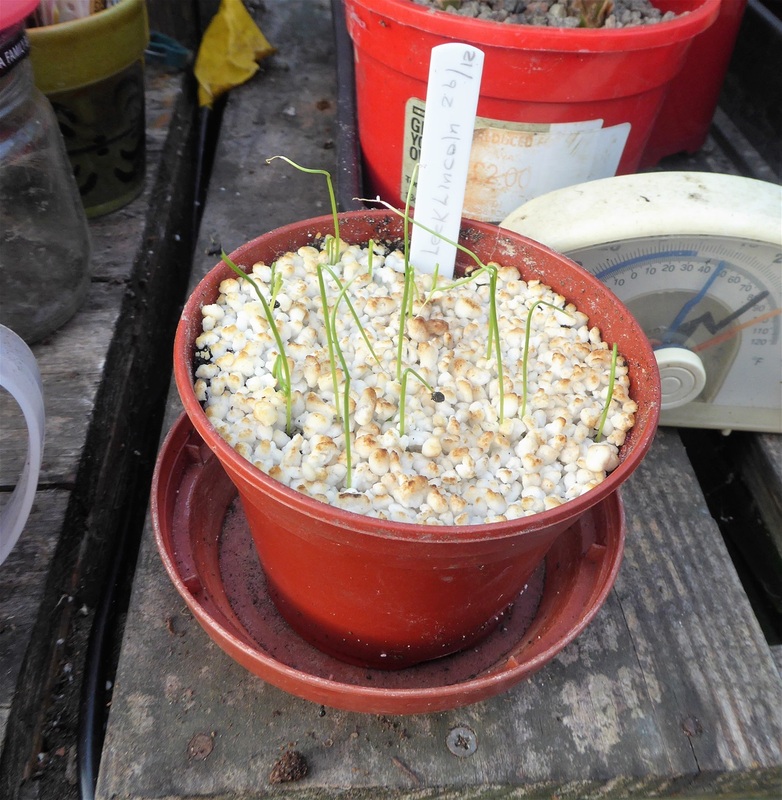 The onion and leek seeds sown on Boxing Day are waving at me now from their pots and trays... look!! But we have had harvests this week to share for Harvest Monday. 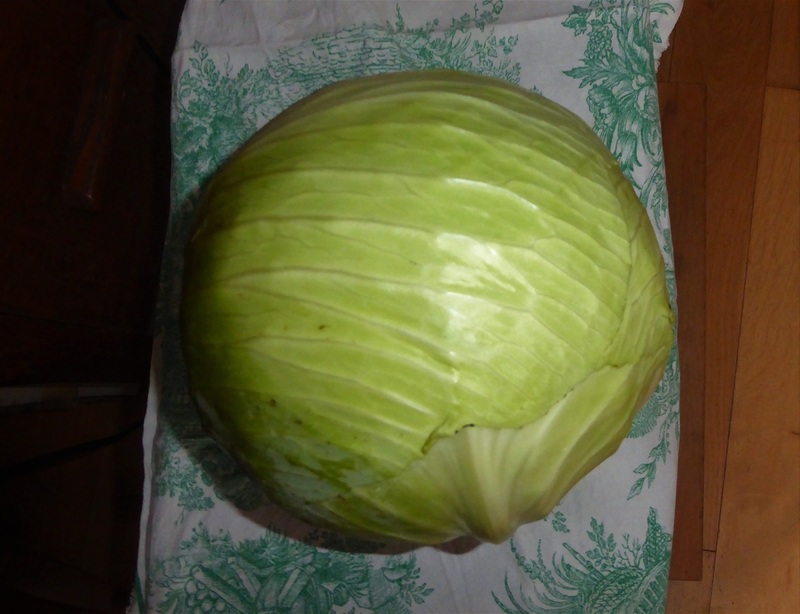 The ballhead cabbage Kilaton has given us another huge head. This one weighed in at 3.26kg trimmed. That's a lot of cabbage. It will sit in the fridge next week while we are away from home but will pretty swiftly be made into our favourite Cabbage & Coconut Cabbage Curry, amongst other things. 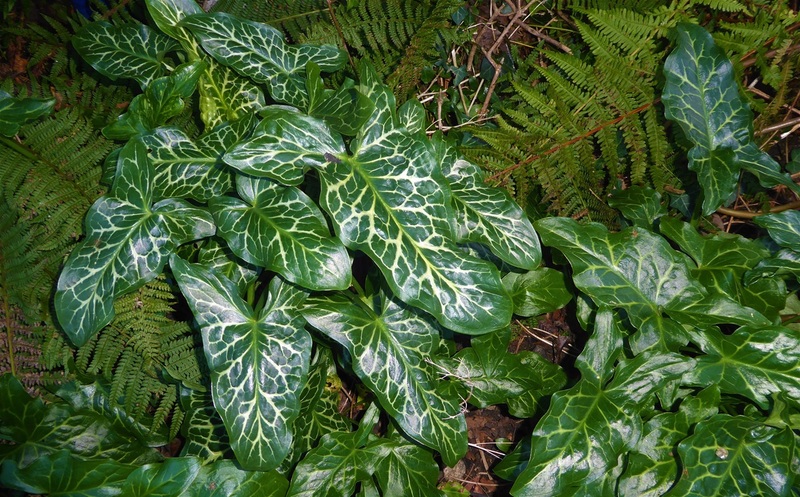 There are still a few in the ground, but with the weather being so wet, I need to keep an eye on them to make sure the outer leaves don't begin to rot, as this can soon spread inwards and spoil the whole head. 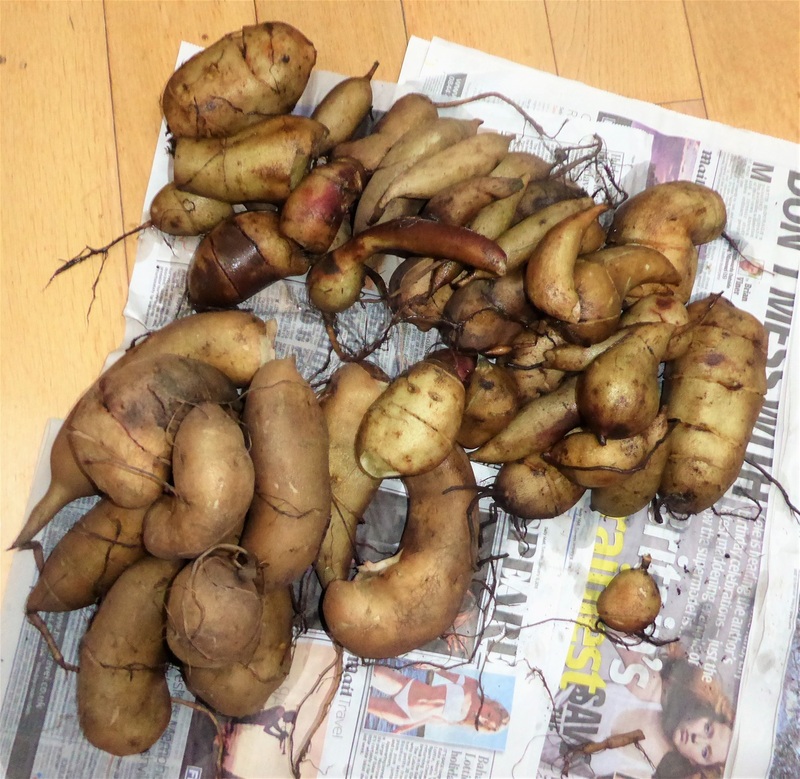 And I have at last tipped out the final three pots of yacon tubers, which gave us just under 6kg, which is plenty. 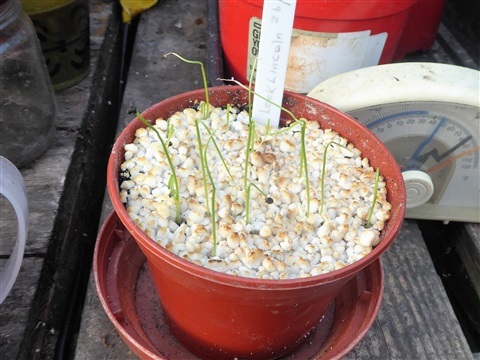 I have carefully saved and repotted the central growing buds for next season's crop, as these are proving a success so far. They seem to store well enough in open trays out in the garage, although we haven't so far had any extended periods of very cold weather. if we do, I shall bring any left indoors for a while, so they don't freeze. Some of them will be sliced and added to stir fries, eaten raw in salads or roast alongside other veggies, but lots will go to make syrup. I'll let you know how that goes. Hopefully less sticky than those figs in rose syrup a few years back! 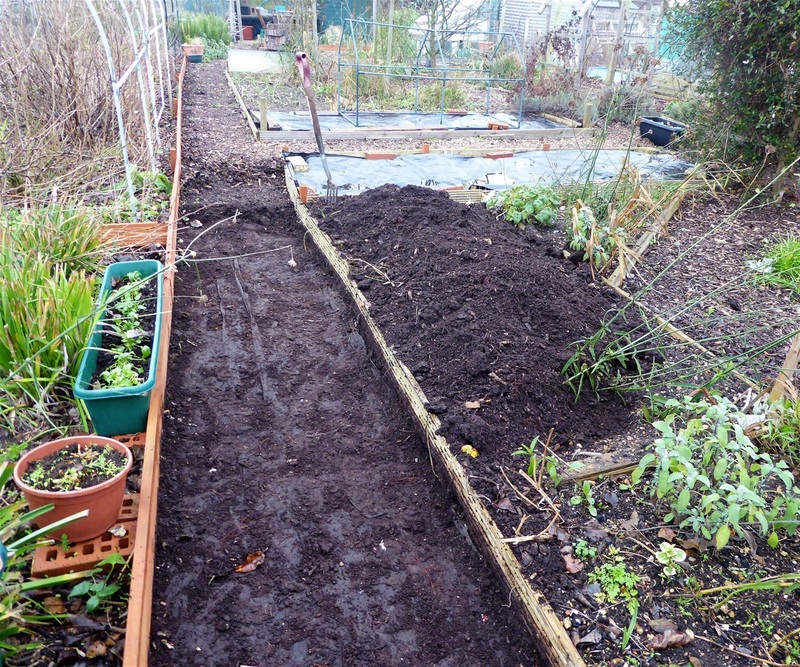 This week I have taken full advantage of the unseasonably mild weather, making a good start on digging out the composted bark from the paths on Plot 146. As I said before, the lower layers have been there nearly seven years, and the material created is perfect organic matter to add to the soil, epscially on Plot 145, which we have been working less than two years. The soil there is still pale and thin, but a good layer of mulched wood chip will do it a power of good. Just look at that dark, rich colour, almost black. Pretty good for no cost whatsover. I have now dug along to the far end of the garlic bed you can see beyond the handle of the fork. 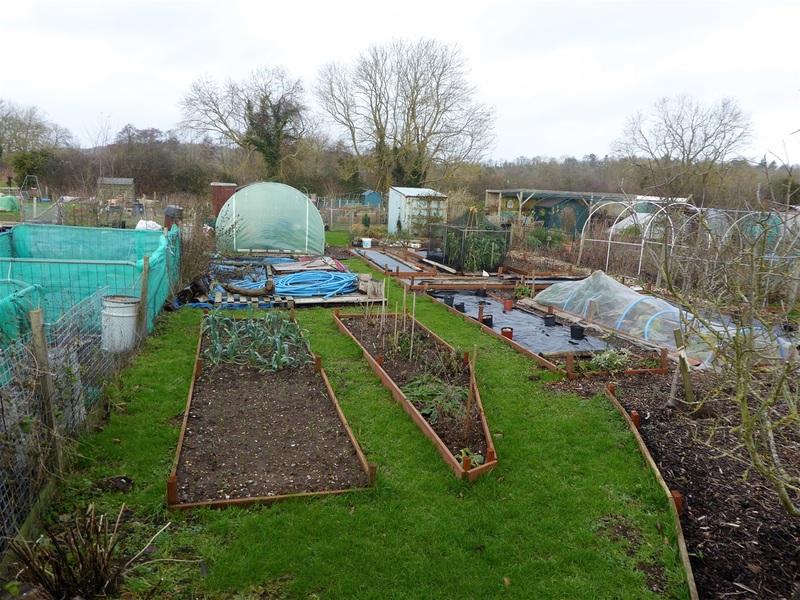 The two beds covered with black plastic have had about four inches of compost added to them before being re-covered. These will have maincrop onions and parsnips in them, and the front one, where first early potatoes will be planted, has far too much on it right now! Half of one 5m bed on #145 has a good layer over it too. When you realise the total area of paths on #146, there is a huge volume still to deal with. I can see it will take some time, as an hour of digging, barrowing and spreading is about all I can manage in one go. I have made a little friend along the way though ... this robin has become very bold in his quest for small bugs and worms. 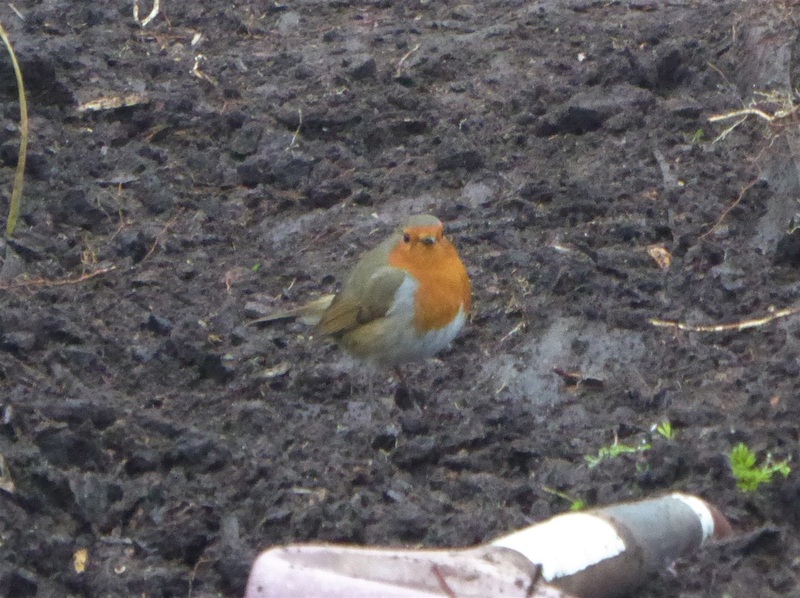 There are a lot of worms in this compost, which bodes well for its fertility as well as the robin's lunch! I hope he/she spots the new nest box in the evergreen honeysuckle over a nearby arch, and finds it to their liking. Someone asked me about the nutrient value of this compost, as when rotting wood is in contact with soil, bacteria etc take Nitrogen from it to facilitate the rotting cycle, and thus deplete the Nitrogen in the soil available for plants to use. They also use atmospheric Nitrogen of course, or wood out in the air would never fully rot. I would think that the main benefit of adding this compost to the soil will be on its structure, as well as increasing the worm population, which will be good for soil health in itself. Once the rotting down is completed, it is unlikely the mix would lack Nitrogen, but if this does prove to be the case, the addition of something like chicken manure pellets would redress this imbalance very quickly. Feeding the soil, not the plants, is key in growing healthy crops. 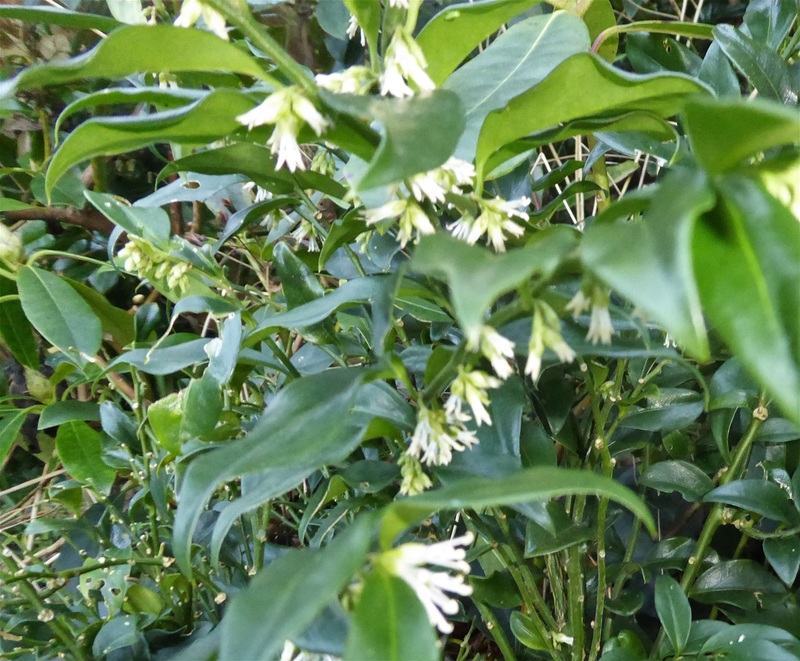 Lime may be needed too (although not at the same time as an unwanted chemical reaction would then occur, locking up nutrients making them unavailable for plants to use) as wood chip mulch is slightly on the acid side. This will be especially important where brassicas are going to be planted. A slightly acid soil should reduce potato scab though! I could go on about soil structure, ecology and chemistry for ages... but I shall stop there. I am sure you see what I mean!! 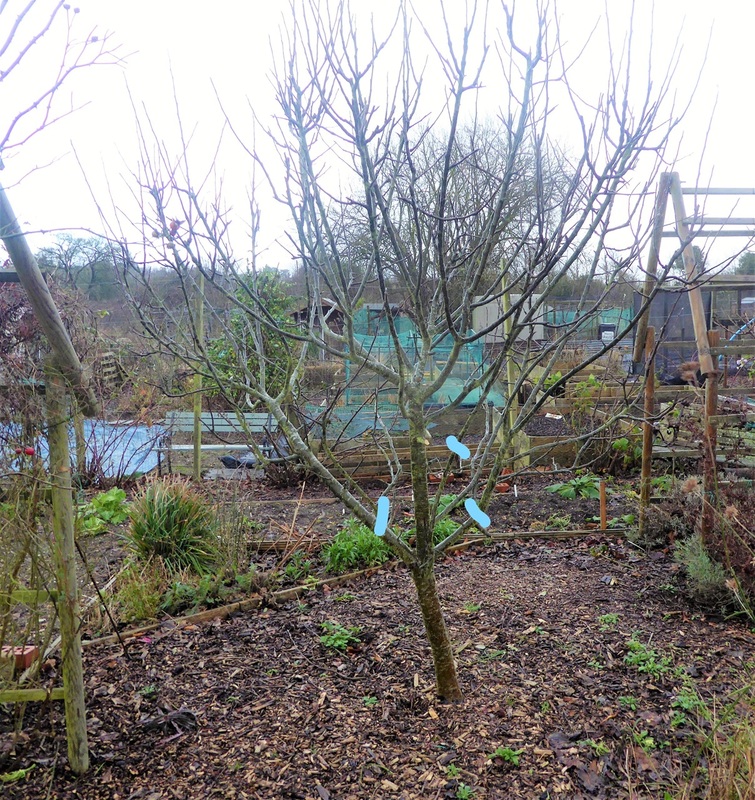 The Winter pruning of fruit bushes has been completed this week, with the Blackcurrants now looking far less congested.I cut out about six of the older branches with dark coloured bark, to allow more light and air into the centre. These had not fruited as well as the younger branches last Summer, so it was time for the bush to lose them. 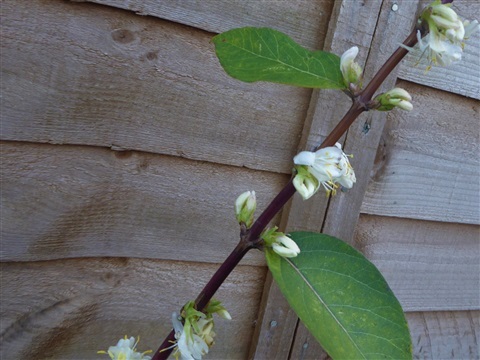 One of the apple trees... the one bought as Braeburn that has turned out to be most likely Lord Derby ... had outgrown its space to the point we were ducking around branches, which was a real nuisance. 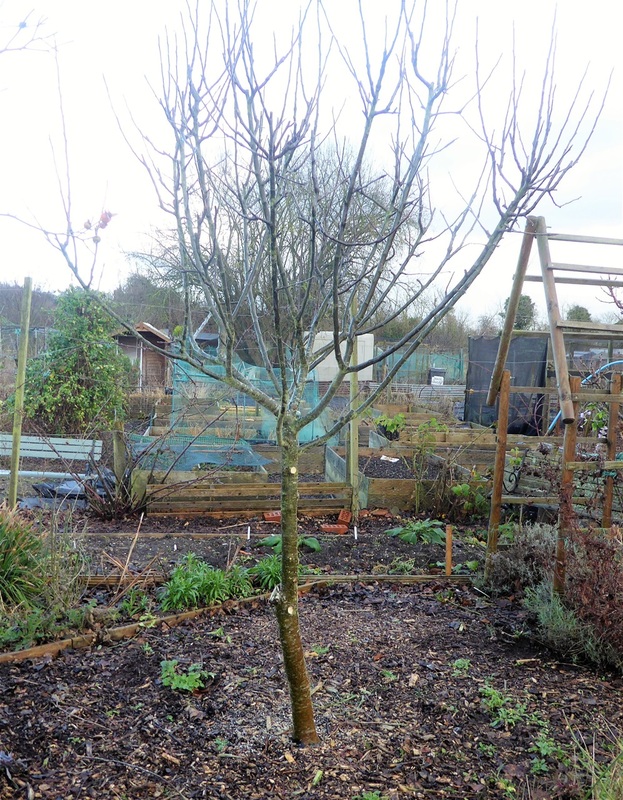 I am not doing any further pruning until the Summer, as the tree needs to adjust to its new shape first. I hope this avoids a rash of long, thin water shoots if at all possible. It'll have a feed of Blood, Fish & Bone and Potasium Sulphate mid February, as long as the ground isn't frozen, and that should help it along a treat. 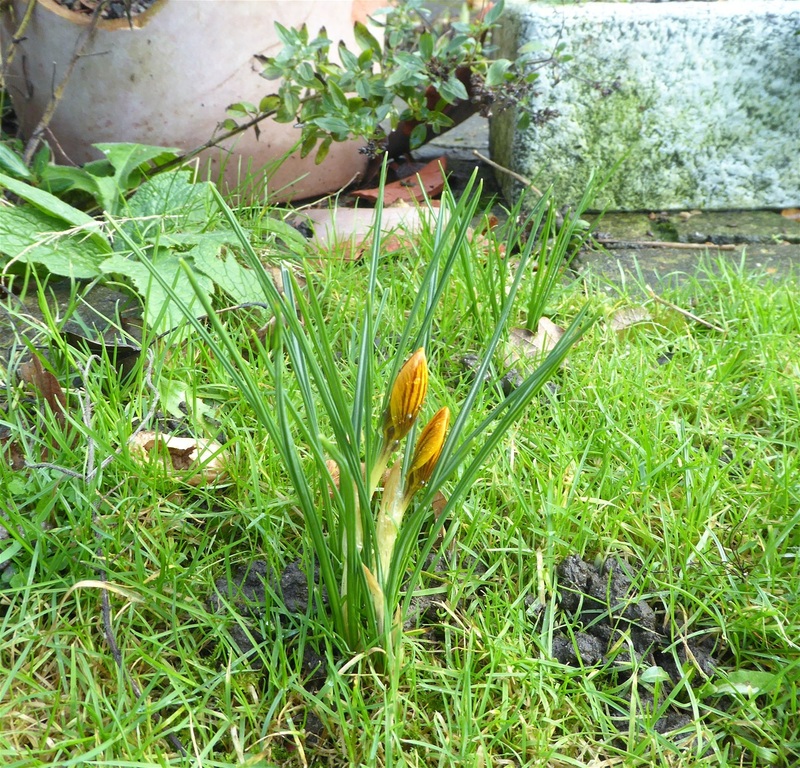 That is the end of this week's blog entry, and to close, here are of some of our early crocuses, poised to unfurl as soon as the first rays of sun shine upon them. 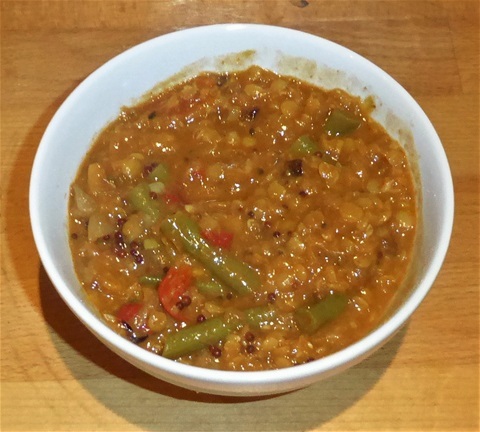 Thank you for reading about what we have been doing, and thank you to the very many of you who enjoyed the dhall recipe posted earlier in the week. I really appreciate knowing there are real people out there! 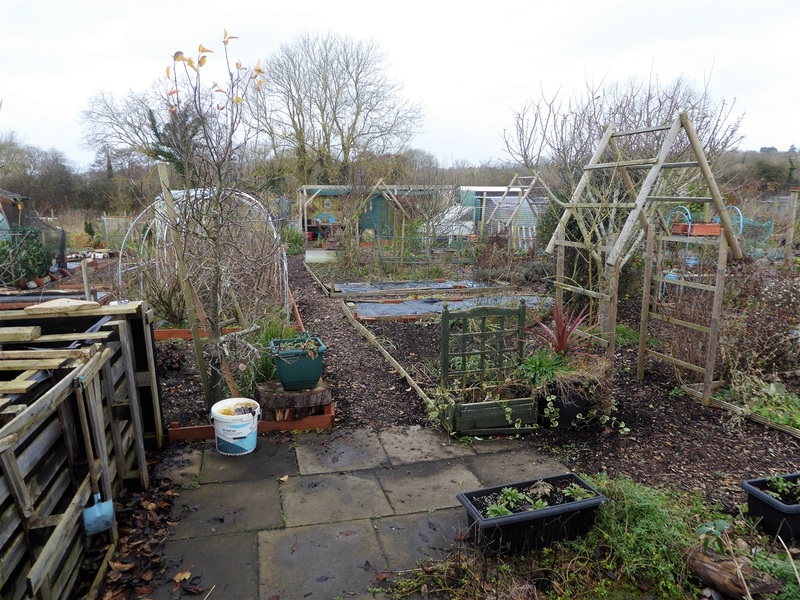 8th January: Allotment temporarily takes second place!!! 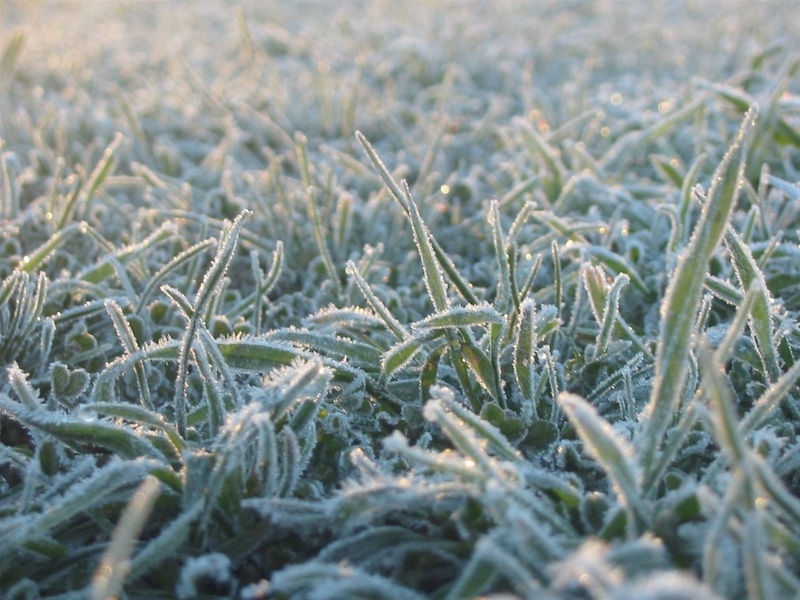 We have had some beautiful frosty mornings this week, but with little to do on the plots, I was not tempted out very often. 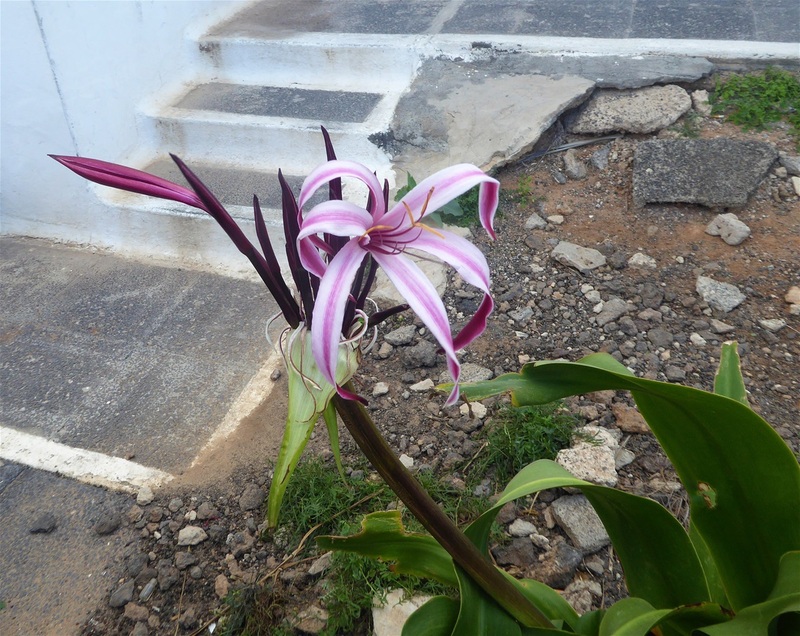 This has been a Good Thing here, as we are in the process of renovating our home from one that looked like The House That Time Forgot, into a fresh, neat and tidy place. As anyone who knows us will understand, this is taking some time!!! The local charity shops are benefitting hugely from our efforts, and already we have a beautiful entrance hall and staircase, a dining room free from clutter and in the kitchen the dresser and worktops are gradually being revealed as "stuff" has space in the cupboards that have now been cleared of unwanted items. The plots have never been far from our minds though. I have now organised the sowing plan through to mid-March, which for the propagator includes chillies, sweet peppers, aubergines (Yes, I know I was never growing them again, but this year they are going to grow in the giant cold frame rather than the polytunnel, in the hope they won't get too hot) and then tomatoes. I am determined not to grow more plants than we need for ourselves, family and friends, so I have drawn a careful plan for how many of each will fit in. I can but try! There always look to be far too many tubers when they are spread out like this. Some will go for an early planting under cover, perhaps as early as the end of February, weather permitting, and three outdoor beds will be given over to potatoes..... Ok, maybe a few too many but I should be able to find a home for any extras. 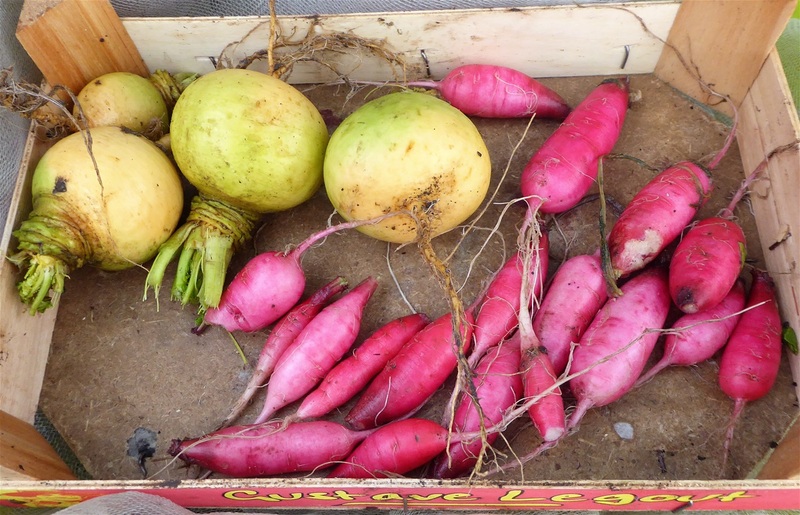 We have had no edible harvests this week, and as I said, have done little on the plots except make sure nothing had blown over in high winds, so this is a really short blog entry. 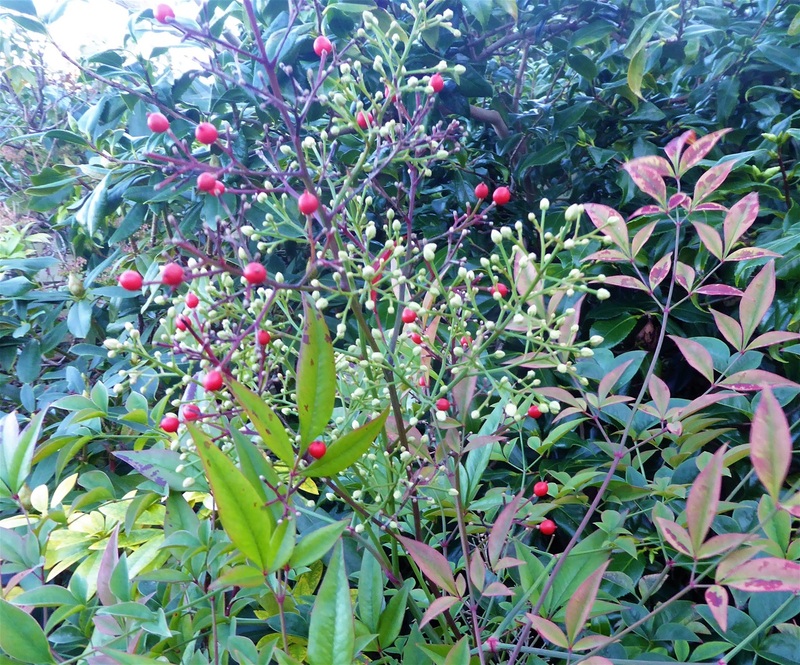 followed by our Heavenly Bamboo Nandina domestica, which has lots of panicles of flower buds already, in amongst sprays of scarlet berries. It is a real beauty, and flourishes amongst our small rhododendrons. As they both originate from regions of the Himalayas, I suppose it is logical. Thank you for reading... I shall be back next Monday, hopefully with an even tidier house and perhaps an onion seedling or two. Fingers crossed! 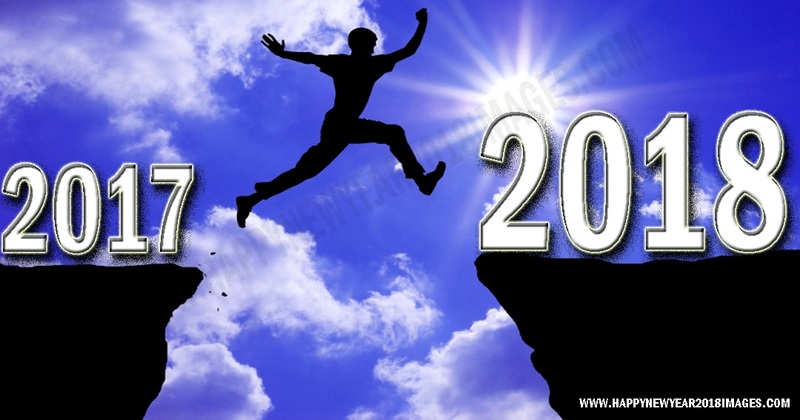 1st January: Happy New Year! 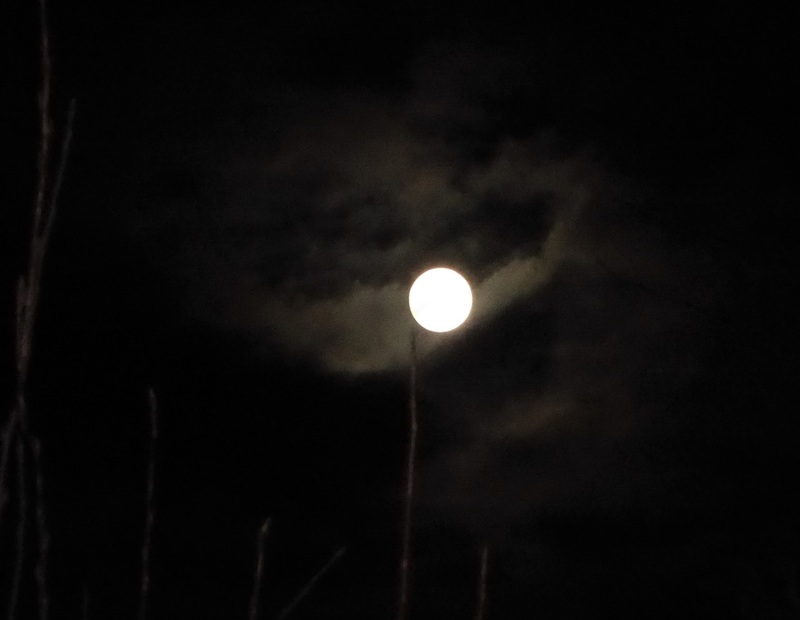 Starting this year with a huge, silver new moon out there...Wolf Moon, the biggest and brightest full moon of the year. I've just been out and taken this photo; it certainly is spectacular, shining out in the sky beyond the bare trees in the garden. We do have plenty to eat from our stored crops though, and today's family barbecue included Sticky Balsamic Potato Wedges and Rainbow Veggie raised crust pie, which used up some of the beetroot from the box in the garage, along with a lot of spinach from the polytunnel. I never make hotwater crust pastry, as we don't eat lard, but using coconut oil worked very well indeed, and with the addition of a small amount of cumin and turmeric was very tasty, even if it needed carving rather than slicing! I feel I should also mention that a whole large jar of dill pickled cucumbers was consumed, mostly by one of our (adult) nephews, who declared them to be the best thing on the table... why, thank you, Aadil! Plot 146 is very wet, being slightly lower-lying than it's neighbour, and the woodchip paths need digging out as over the last seven years each layer of wood has mulched down until there is around 10 -12 cm of rich composted material under the top layer of chippings, which makes it even wetter. That's going to be a long, hard job, but one that I shall have to start soon. The issue really is where to store all that extra compost until it is needed for the beds in the second polytunnel. 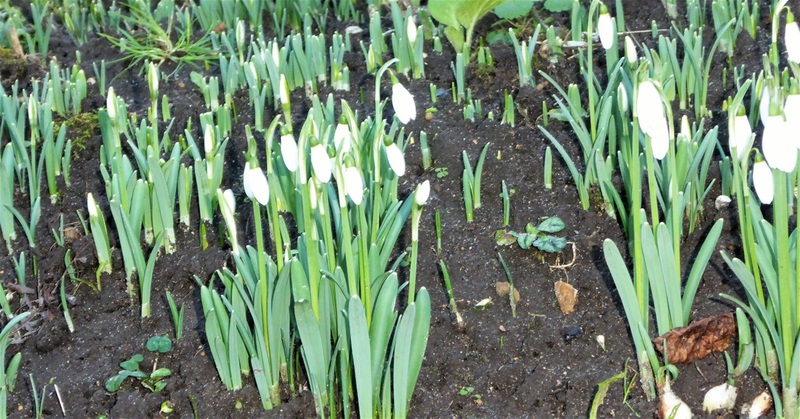 Maybe on an empty bed that isn't going to be planted up until about April time? Plot 145 is less than two years old, and the paths still drain well. The grass looks very lush, and although it is quite soft underfoot, we are not walking on it all that much right now so it is not getting too muddy. 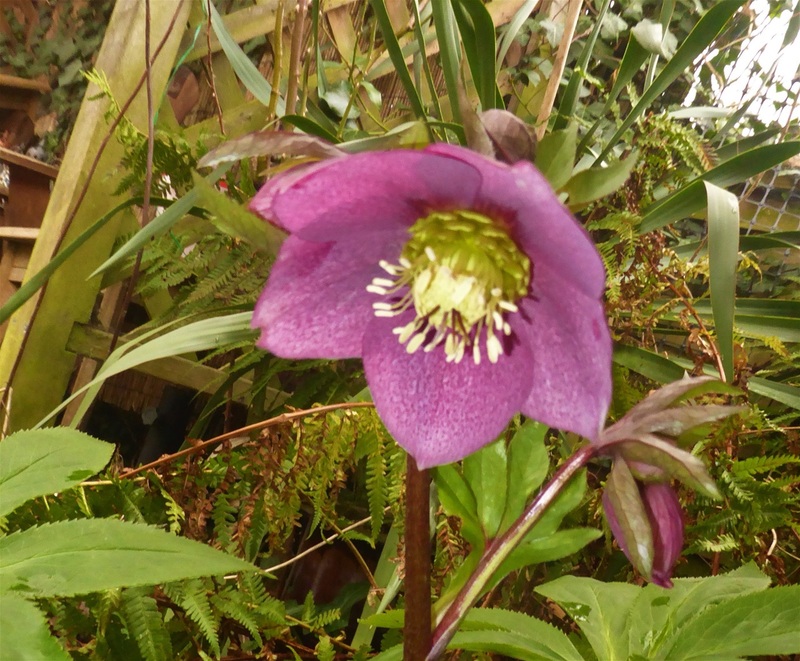 This next couple of weeks is a time to pause, take breath, decide what we shall grow again this season, what is definitely not "On The List", and what, out of all the tempting new varieties parading across our eye there might be space for. The rotation plan is already in place, so it is a case of putting that jigsaw together in such a way that we eat well throughout the year once again. The plots will gently tick over, tools will be sharpened and oiled and space cleared on the kitchen windowsill for the propagator.